Those of you waiting for pictures and details about the 2008 Suzuki Equator can stop holding their breath. Thanks to an enthusiastic Suzuki press team starting their rehearsal, we've got photos of the three (count'em THREE) Suzuki Equator models including the basic version, a miltary-looking off road version and a yellow, super off road appearance package (there may be the utility to back it up, we're not sure yet). 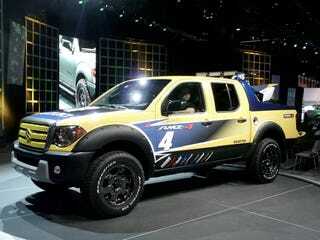 From what we hear, these Suzuki trucks should go on sale in the third quarter of this year. More when the company has its actual reveal.